Mumbai, or Bombay as we all know it, is a schizophrenic city. Inviting welcoming affectionate and warm one minute, hostile, intimidating and disorienting the next…. 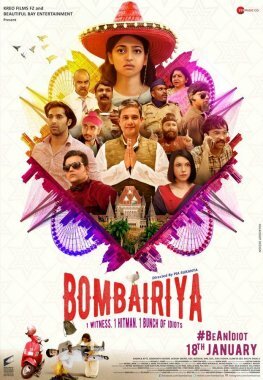 Bombairiya captures the polarized propensities of the split city with vigour and humour. Sure, towards the midpoint the edifice of chaos built on the premise of ‘One Day in the Life Of Radhika Apte’(she gets top solo billing) begins to fall apart. And you feel the film is trying to cram in too much physical activity at the cost of giving the plot and the characters space to breathe. There is an unstoppable energy about the film that doesn’t always work in its favour. Often times, I felt the characters were running away from themselves and from us, the audience. The relentless bhaag–daud (helter-skelter) eventually seeps into the character-driven narrative. But before it does, the people who populate the bustle over the hustle are thrown so close to our affections that we want the progressively spiralling plot to somehow come together for their sake. The writing favours defining interactive moments on a random beat that bring strangers together. There is Meghna (Apte) running around a vain philandering film star Karan Kapoor (Ravi Kissan, in splendid form as usual) when she collides into a courier man (Siddhant Kapoor). Within minutes she is “rescued” by an incredibly kindhearted goodlooking dude Abhishek who gets busy solving all of Meghna’s problem on the road, from replacing her lost shoes with his spare sneakers, to talking to her Daadi on the phone about her horribly askewed love life (Jim Sarbh shows up as her ex-boyfriend in a one-scene appearance), to accompanying her through an adventure that leaves a lot of ‘huh’ spaces in the narrative. It all gets into scramble that scampers clumsily intoa church at the end. But when the going is good, the plot and performances simply rock. The underrated underused Shilpa Shukla as Ravi Kissan’s bossy suspicious politician-wife has just a couple of scenes to make her presence felt. And she gets to it without losing a beat. Equally memorable is Dhanendra Kawade as a cop trying to do the right thing by a city hellbent onbeing mischievous. Come to think of it, the actors are all in dazzling form. Is Radhika Apte ever caught on the wrong foot (even when she is without footwear in this film)? She manages to keep ahead of the ferocious flurry in the plot even when having to suddenly do a little kissy-smoochy scene with Akshay Oberoi’s reluctant fiancée-to-be (who is, sigh, a lesbian)…or made to sing a Bhajan in the car with Oberoi’s parents (nicely played by Paromita Chatterjee and Abhijit Bhor). Adil Hussain as a jailed politician and Amit Sial as a pivotal character propelling the drama ahead to its anarchic finale (I confess I didn’t really get a fix on his place in the saturated plot), convey so much with their silent smirks. But my favourite is Akshay Oberoi who never lets a script down. Here he succeeds in keeping his angelic character from getting disastrously boring. Oberoi is an actor who never disappoints. Here is a film that will make you smile to the end even when the going gets really tough for the proceedings. You know someone up there is looking out for the characters. And it isn’t God.